SR Windows & Glass provides window installation services to the greater Phoenix area and Maricopa County, AZ. Whether you are retrofitting your home, building new construction or replacing a damaged unit, our glaziers will be able to guide you through the window selection process and installing your new windows. Gone are the days when windows used to be just another component in a house or a residential building. Modern windows have become specialized components of the building envelope, serving a variety of functions. Windows play a key role in stopping heat gain or heat loss, depending on the season in Arizona. They also add to the aesthetics of a residence. In some cases, a window may be retrofitted by replacing a broken single pane or failed dual pane unit with a new one. This type of window glass replacement includes removing the defective glass and installing a new glass unit. The advantage of this process is the original frame remains in tact, saving time and money. SR Windows & Glass are experts at retrofitting window glass and replacement windows. 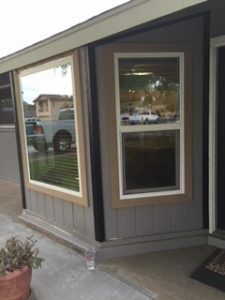 In the case of remodeling a home with new windows or new build construction, a complete window package will be ordered to fit the design of the home. There are many manufacturers to choose from and it pays to have a window expert guide you through the process. It is possible to over upgrade your windows and most manufacturers do a good job of convincing homeowners they need the most expensive model available. The reality is most people are on a budget and selecting an affordable window will bring the greatest ROI when reselling your home. Mid-grade windows usually have the same features and almost the same performance as the high-end windows but at a more reasonable cost. Similar to other components of a home, windows also need to replaced as new technologies emerge or the older windows fail. Some of the tell-tale signs that windows need replacement are condensation and fogging, mold, rot, and cracked caulking. It could also be a case of a window being broken and therefore the need for replacement. In case of window replacement for a residential project, you can fully replace a window which includes the frame and glass. You can also choose to replace only existing frames with new glass. The choice would be dependent on the condition of the window. Whatever may be the choice make sure that the periphery of the windows is sealed with waterproof membranes and judicious amounts of caulk. These days specially made silicone sealants too are available. All of them add to the thermal efficiency of a window. 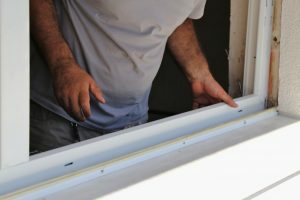 When most people are considering a window remodeling project, they are either upgrading from single pane windows to more energy efficient windows or they have multiple failed window units in the home and it’s time for replacement. In either case, insulated glass units (IGUs), will be an affordable and sensible choice. IGUs are also known as double glazing and consist of two or more panes of glass, creating an insulated gap between the two panes of glass. Triple glazing takes this concept one step further and introduces a second insulated gap into the structure. The glass is sealed and separated apart with a spacer bar. The space in between could also be filled with gas. In fact, the IGU can be combined with a variety of things such as low-E coatings, laminates or other design patterns, etc. The double glazing helps in providing the glass panes with characteristic properties such as reduced infiltration, condensation, acoustic insulation, as well as superior transparency. A window supplier should be able to recommend you the right grade based on your particular project. The best choice for places with extreme hot and cool temperatures, like we experience in Phoenix, insulated windows. These windows are designed to keep heat in or out of a home. The thermal conductivity of a window, or in simple terms the amount of heat allowed by a window can be measured using, what is known as the ‘U-factor’. Generally speaking the lower the U-factor, the more would insulating the window would be during the Phoenix summer. Gas filled (typically Argon filled) windows enhance the thermal performance of the window, due to a lower thermal transfer factor. Argon filled insulated glass units are now standard for mid-grade and higher window brands. The gas layer in between the double-glazed window panes also helps in improving the soundproofing characteristics of the window. In the case of places with hotter climate, tinted glass is the favorite for obvious reasons. These glasses help buildings to literally keep their cool, thanks to their ability to absorb heat. Low-emissivity glass, also known as low-E glass have become more affordable and are also readily available. These glasses score high when it comes to their thermal efficiency. Low-E glass has a special coating on top, which allows on visible light inside a building while reflecting infrared portion of the light. What makes these glasses even more special is also their ability to reflect back any infrared heat that may be already inside a building. This way the glasses are an excellent option in Arizona’s diverse climatic zones. For houses located in the geographical areas of Phoenix where high winds and hail are a concern, impact-resistant or tempered glass is a good choice. Tempered safety glass is designed in such a way to break into tiny harmless pieces when shattered and is required for windows within 24 inches of a doorway. Choosing a window installation contractor is critical to the success of a window replacement project. While DIY window installation projects may look exciting and doable, the long term risk of unit failure goes up significantly. There are many window installers in Phoenix and they are also referred to as a ‘glazier’. Glaziers are window installer who only specialize in windows and glass. They should be able to suggest the right type of frame and grade of glass for your particular project. While some big box retailers may refer you to a team of installers, many of these professionals also run their own independent services. A professional window installer should be able to manage all aspects of a window installation project and provide expertise to the construction tasks before and after installation. A professional window installation services company would always incorporate your ideas and be willing to make some last-minute changes if needed be during a project.